Poor water pressure can make simple everyday activities like bathing and washing the dishes difficult and more time-consuming. A great solution in this case would be to install a high pressure pump that is designed to increase the pressure in your pipes at relatively low water flow. All high pressure water pumps rely on the same principles by applying pressure to water with the main purpose to boost the flow. They make use of a specifically designed device know as prison or plunger, which is placed inside a cylinder that applies more pressure on the water, thus making it move faster within the pipes. It’s important to mention that the name high pressure water pumps can often be misleading since these pumps don’t create pressure, instead they’re designed to deliver a higher water flow. The flow of water, measured in gallons per minute (gpm), is basically the volume of water that is moving at a given speed during a specific period of time. The operating cycle of all high pressure water pumps consist of two stages: suction and compression. During the suction stage, the pump delivers water into the cylinder, while the compression stage is the part of the operating cycle when the pump pushes the water out of the cylinder. There are various types of high pressure water pumps that differ in both efficiency and performance. Some are specifically designed for heavy duty industrial applications, others are better suited to home applications and there are models that can be used with both. To choose the right pump that will best suit your specific needs, there are some essential factors you should keep in mind before making a purchase. A high pressure water pump can be powered by either a gas engine or an electrical motor. An electrical water pump can operate on either 120V or 230V, depending on its design and specific use. Both models are designed to be used indoors and can be plugged into a standard outlet. But, it’s important to mention that some models of 230V pumps may require installation of special electrical outlets. Unlike electrical pumps that can only be used in locations where outlets are readily available, the use of gas powered pumps is not limited by electrical sockets and cords. This makes them ideal for outdoor use. They are more powerful than their electrical counterparts, but also require more maintenance and emit carbon monoxide, which means they shouldn’t be used indoors. Therefore, if you’re looking for a safe and efficient pump that can solve the poor water pressure in your home, an electrical model might be just the thing you’re looking for. When comparing different models of pumps, there are some essential features to keep in mind that will help you figure out what model will best suit your specific needs. The gmp discharge capacity is the first feature to look our for simply because it has a major influence on the pump’s performance and efficiency. As mentioned before gmp (gallons per minute) determines the speed at which the pump moves the water from one point to another. Another feature to look out for is the design and material of the volute, which is the component that creates the pressure needed to boost the water flow. Look for a pump that has a sturdy volute, preferably made of cast iron which is a highly resistant material. 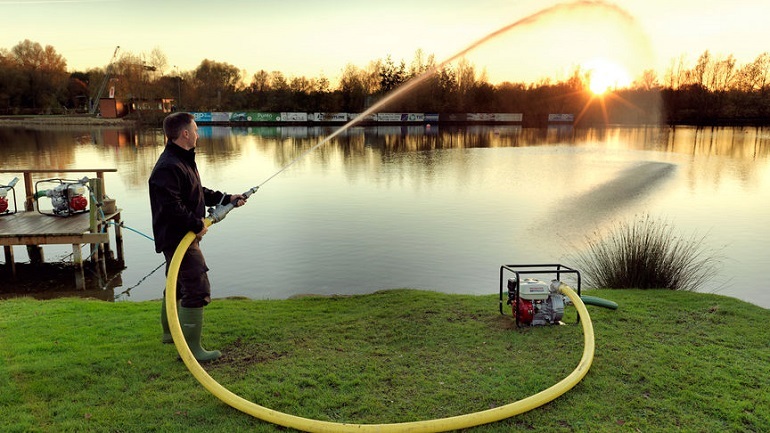 All high pressure water pumps have advanced features and practical design, which makes them the ideal solution for any kind of issues in your home related to low water pressure. However, there are some accessories that can further enhance the efficiency of your pump. For instance, modern adaptors allow you to connect your pump to a hose, thus extending its uses around the house. Investing in quality durable gaskets designed to keep the pump hose kit working at optimum performance is also a smart move.